At Bella Vista Farm, we breed to grow the population, accomplishments, and reputation of the Cleveland Bay Horse. We believe that part-breds are AS important to the breed's long-term success as purebreds. Below are the mares we use for breeding that are not pure Cleveland Bay. We are very much interested in harnessing the strengths of different breeds that in combination can provide an incredibly athletic and competitive horse. We typically focus on thoroughbreds and warmblood seeking agility, movement, and speed to combine with the strengths of the Cleveland Bay - temperament, substance/bone, and sturdiness. Bellavista Banter is a 2013 Holsteiner/TB mare bred here on the farm. She was sired by a talented eventing horse sire, Cimarron. Cimarron is a Holsteiner who is a former #1 USEF Sire of Eventing Horses. Banter's dam was a stakes winning thoroughbred mare, Seeyouinmydreams, sired by Comet Shine. Bella Vista feels that the combined pedigree of Banter's dam and sire combined with the genes of a Cleveland Bay has the potential to be a spectacular sporthorse. Banter is 16.3hh as a three year old. 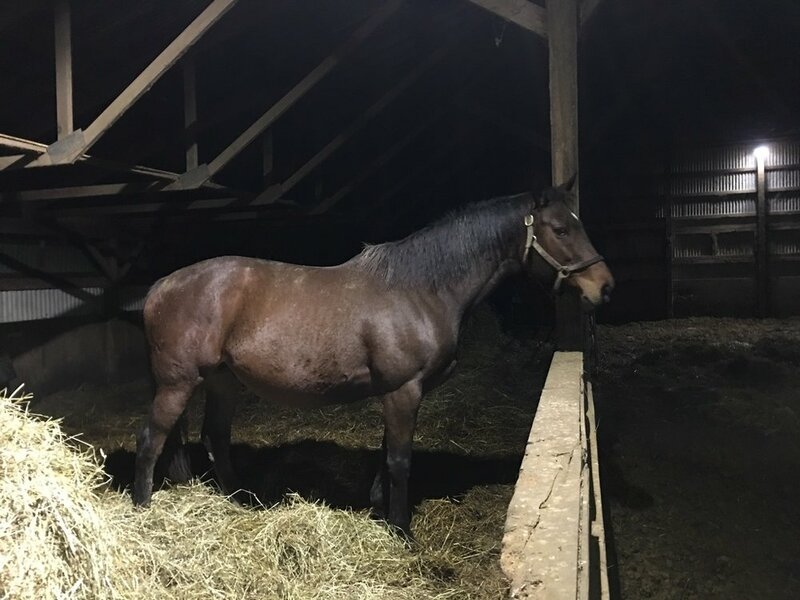 A full three year old sister is for sale on our sale page. 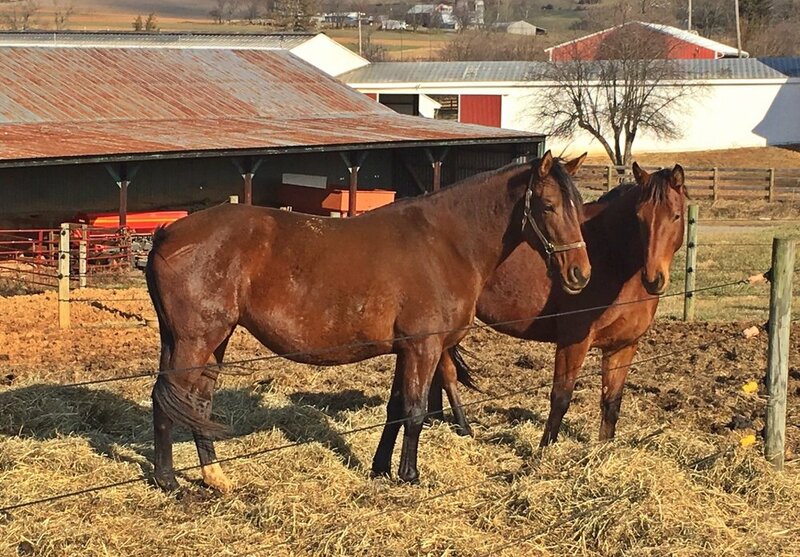 Valentine is a premium Holsteiner mare foaled in 2005. She is sired by Riverman and out of Vigorious Gal. 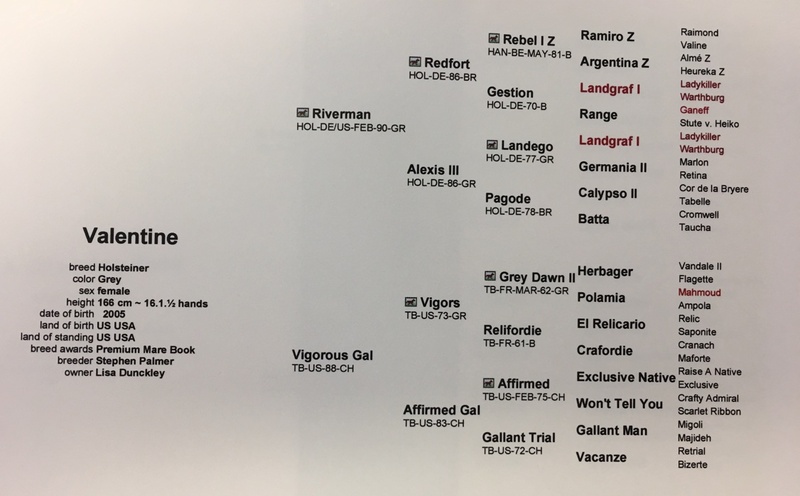 Valentine is also in the mare books of the Oldenberg Registry NA and Rhineland-Pfalz-Saar Int'l. Valentine has been a broodmare most of her life and came to Bella Vista in late 2014 after a sporthorse breeding career in California. Valentine is the dam of Bellavista Excalibur (2016 1/2 CB Sporthorse) and will be bred again in 2017 for another CB Sporthorse foal. Valentine is 16.1hh and has exquisite movement. Posey came to Bella Vista from a thoroughbred farm in Virginia in 2011. She was acquired as a yearling from one of the top TB auctions in Kentucky for $60k. After just a couple of racing tries, they quickly determined she didn't have a penchant for it and sent her to the broodmare shed. Posey has given Bella Vista two foals and is expecting a third in May 2017. Posey's foals have tended to inherit her size and strength. Bellavista Dulany, Posey's 2015 filly is currently for sale. Posey is 17 hh, bay with a sock and a star.